A typical cricket season is uniquely recorded in Stoneleigh Cricket Club’s Fixture Card of 1868. The Fixture Card is signed by Hon. Gilbert H. C. Leigh and is presented to his younger brother Hon.Rupert Leigh. Gilbert Leigh was seventeen years old and was at Harrow School. 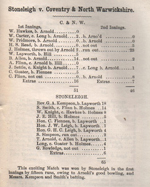 The 1868 fixture card records his return to Stoneleigh Abbey to play cricket for Stoneleigh Cricket Club during the months of August and September. He is joined in the team by his cousin Hon. C. Fiennes and his uncle James Leigh. Stoneleigh Cricket Club recorded wins against Coventry and North Warwick and Stratford Cricket Clubs! Other fixtures included playing Stoneleigh village which is still an annual fixture today. Stoneleigh Cricket Club also had a junior team which included Gilbert’s younger brothers, Francis aged 13 and Rupert aged 12. They recorded wins against Warwick Borough School and Kenilworth Vicarage.